OuterVision Power Supply Calculator is the most accurate PC power consumption calculator available and is trusted by computer enthusiasts, PC hardware and power supply manufacturers across the Globe. Are you building a modern gaming PC, low power HTPC media server, or maybe you need to figure out power requirements for a rack in a data center? 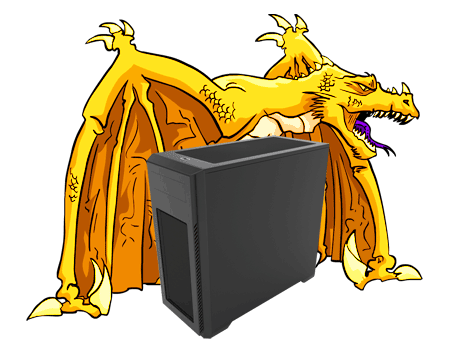 We've got you covered - OuterVision PSU Calculator will help you to select a suitable power supply unit and even Uninterruptible Power Supply (UPS) for your system. Building cryptocurrency mining rig? Check our Mining Rig Builder tool. 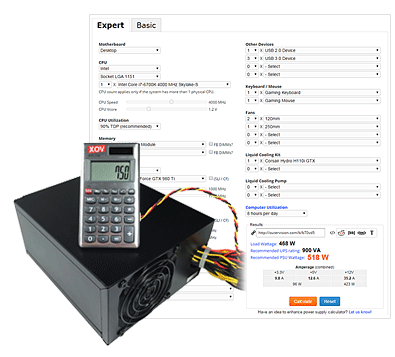 Basic version of the OuterVision Power Supply Calculator allows users to quickly estimate power consumption with minimal selection of PC parts. On the other hand, our Expert, more advanced version of the PSU Calculator greatly extends the ability to select various PC parts and components, adds CPU and Graphics card overclocking, and allows consumers to calculate PC energy consumption, compare PSU efficiencies, and ultimately project energy cost. CPU count: by default it's 1 physical chip. Multicore CPU still counts as 1 physical CPU. What power supply do I need? To answer this question, OuterVision PSU Calculator analyzes dozens of power supplies per each certification category, compares their efficiency, unit price, computer power consumption, overall PC energy cost, and payback period. Based on these analysis, we provide recommendation to our users with the best bang for the buck power supply per each certification category. The user has an option to compare the recommended power supplies, adjust electricity cost to see PC's overall energy cost per year, and select the right power supply that fits their budget.